In the future, your houseplants may actually become more like pets. This is because you may be able to communicate with them, or at least understand their needs. Perhaps we can develop sensors which understand their vibrational energy, or their sense of well-being. Some say plants are mindless and they don't understand, but that hardly makes sense as they are able to adapt to their environment often better than people. If you turn a houseplant away from the Sun, it will go ahead and turn its leaves back towards the sun within a few days. Okay so let's talk shall we? There was an interesting article recently in the Wall Street Journal on September 11, 2012 titled; "Alert: Your Plant Needs Water - New Wireless Sensors Are Connecting Everyday Objects with People" by Jessica E. Vascellaro which showed off some of the latest personal tech with apps to match. One was a device that can hook up with a moisture sensor to tell when the soil in the pot of a house plant needs water, then the WiFi signal would alert you or your iPhone for instance. What if our houseplants began to evolve realizing that when they sent out a certain vibrational pulse, it would cause you to come and water them? What if that biological mechanism figured that out? No, it wouldn't be like a baby crying for milk, it would be the bacteria within the plant sending out a signal that it was ready to receive water. Those plants which were able to evolve and send out the strongest signals as soon as they needed water would have the ability to grow faster and stronger, pollinate faster, and therefore they would be chosen by humans as preferable houseplants. Just as we have domesticated our pets and thus, they have evolved for certain types of behavior, and just as we have modified our crop species by replanting and choosing the seeds from the most bountiful, in this way we would also be evolving our houseplants - plants which could work with our sensors, and communicate their needs to us in this way. 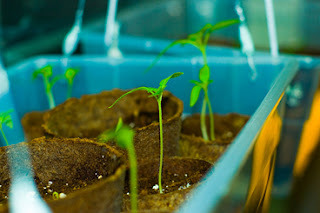 Those plants which did not respond or let us know that they needed water would not get the water in time therefore they wouldn't grow as fast, thus, they would not be desired as much, or carried in the nurseries which sell houseplants to big box home improvement stores. Okay so, indeed I'd like you to think about this for a little bit, and consider all the benefits and applications to such future technologies.